Saint Patrick's Festival may be winding down, but those whose celebrations centred around pubs more than parades are probably still feeling green. At least they'll be spared pinches from any leprechauns still on the lookout for natives not clad in that cliched colour. The fact that 'the little folk' inform our festive garb illustrates our unique relationship with otherworldly realms. For instead of fairy tales about magic porridge pots, we share supernatural stories about perpetually smoking pipes. Ever-bubbling bowls of gruel don't get a mention in this yarn from the Kingdom of Kerry about a tobacco toking ghoul who used to haunt a lonely spot on the road from Dunquin to Ballyferriter. There she would sit on a large rock, terrifying the bejeebers out of passers-by as she puffed away on her pipe. No wonder most people gave the place a wide berth, taking a roundabout route. Until the night a man doused with Dutch courage after a session with his cronies, and craving a smoke, had the audacity to ask her for a puff. The surprisingly well-mannered wraith obliged. The chancer took a few puffs, before handing the pipe back with the conventional prayer 'May the Lord have mercy on the souls of your dead!' This he did three times, till the ghost suddenly spoke. She explained that she was a poor travelling woman who had died there long ago. Her body was never found so no one had uttered a prayer for her repose. But now his prayers had released her from her long vigil. She gave him the pipe as a parting gift, promising that as long as he kept her tale a secret it would always remain stuffed with tobacco, no matter how much he puffed. Cue one happy chain smoker - talk about coffin nail nirvana! For so was the case - until the same lubricant that lent him the bravado to cadge off a ghost also caused him to blab. Thus the spell was broken and the old clay pipe was ever more cold and empty. Much like the heart of the loathsome landlord, whose ghost frightened away any folk hoping to find his hidden treasure. All but one servant boy, who volunteered to stay overnight in the haunted house. He brought with him two bottles that surely encapsulate the concerns of many Irish Catholics. For one contained holy water, while the other was filled with what some call the water of life (known in some quarters as whiskey). The late lingering landlord clearly agreed, for that night his spiteful spirit crept from the canvas of his portrait, all the while his evil eye fixed on the beckoning bottles. He grabbed one and knocked it back - and vanished with a blue flash and loud crackle, leaving only a smell of brimstone behind. For this literal demon for the drink chose the wrong bottle and so was evicted into eternity. Leaving the savvy servant to grab his stash of gold that he discovered behind his now empty portrait. And the rest of us sinners green with envy. 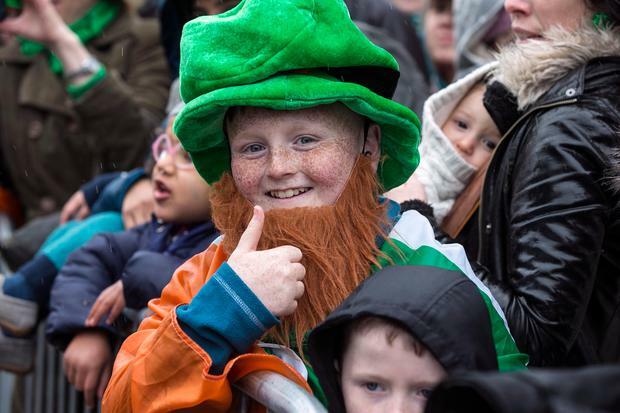 Independent.ie Newsdesk Hundreds and thousands are set to attend St Patrick's Day parades around the country today - stick with us while we keep you up-to-date with the news and events from around the country and world.